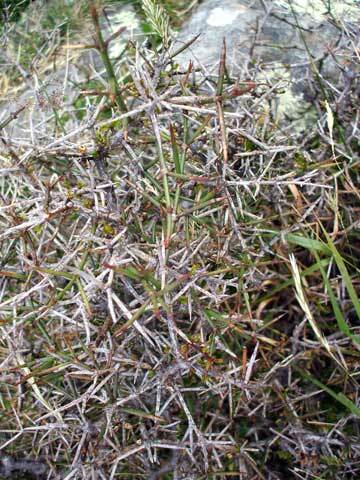 Matagouri or wild Irishman (Discaria toumatou) is the only native plant with thorns. A drought-tolerant divaricating shrub, it is widespread in the eastern South Island and Central Otago. Matagouri is uncommon in the North Island, growing in only a few coastal sites. For much of the year it has few leaves, and its stems and thorns carry out photosynthesis. A flush of new leaves is produced during wet periods. Matagouri forms open shrubland on dry infertile soils, but can become dense scrubland up to 5 metres tall on superphosphate-fertilised land. Many South Island hill-country farmers consider it a weed, and regularly burn or spray it.